﻿Jodies Journey - Blog 63. 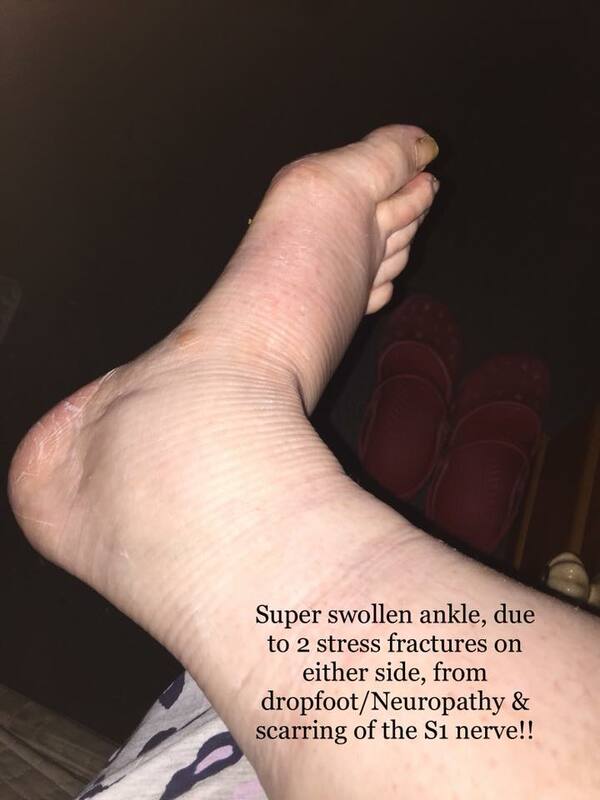 So, I’ve had some mystery swelling going on (in now) both feet | ankles | lower legs, the R foot gets bigger than the L - we think due to my S1 neuropathy, causing drop foot, causing stress fractures. The overall swelling my new OT believes is a late common issue/side effect after bone marrow transplant of GVHD (Graft Vs. Host Disease). After asking; she did confirm that she has seen Odema type swelling post transplant in many other Heam patients. The vascular system ages faster in a person like me, due to all of my past treatment protocols (instead of a woman with 40 yr old veins), I seem to have swollen like a 70 yr old woman. My body has probably had enough and steroids don’t help either, however - I have no choice. So, I am now trying on some hospital grade compression stockings to push and constrict that fluid up into my body, where it should stay. I have knee length ones on currently, which feel comfortable - almost look like burns compression body stockings. And when I am doing more walking and activity - I have full length ‘chap’ type compression stockings, that go right to the waist, under my clothes (of course), lol. Getting them on is a bit of a challenge, but if they help, they will stay - so my feet and ankles don’t look like an elephant. Add to this currently, my new osteo surgeon is keeping a close eye on my R hip ball joint for AVN (Avascular Necrosis) disease progression. We are currently doing an MRI once per month to decide on how urgent we should progress with treatment and/or surgery (if needed). Our current take on the gap of bone death in that joint (due to steroids) is a ‘watch n wait’ approach. If the disease looks like it is fast & progressive - we go to what’s called ‘decompression’ of that hip ball joint. Under a general (Thank God), a small hole is drilled into that hip ball to allow blood flow into the existing cavity. The extra blood may kick start the regrowth of bone to the ball joint, to avoid a R hip replacement and eventually a total hip replacement. Most people with AVN of the hip get disease in both hip ball’s and find it in an advanced state, due to pain and difficulties with walking. However, we found mine, quite literally by mistake, via a neurologist convened check-up MRI of the S1 nerve roots. Similar location. Although, my new surgeon did concur with me, there are no accidents and ‘it was meant to be’ that we found that AVN so early in the piece - when we weren’t expecting to find it. An interesting statement coming from a doctor. I know that God had a hand in that, as I feel He inspired me to push for an MRI, when my neurologist didn’t see the point. I say, if you have extra nerve pain (which I’ve had @ night), then an MRI is warranted ‘just in case’. It was the right thing to do. Your probably saying to yourself ‘Oh my G, Jodie - how on earth are you coping with all of this crappy-crap’? To be honest - it’s all one day @ at time for me. There is no way I can control these issues, I just have to get on with life and live as full as I can. I think with all of this movement - it’s time for a new blog. Now to have some lunch and onto the NDIS (National Disability Insurance Service) office to submit applications for support for three of us: Julia, Anna and myself. I thank God we live in a place that provides all of these incredible health and disability supports, free of charge. Regardless of how difficult my circumstances have been over the years; I can only be positive and truly thankful for the supports we get - I have chosen to see everything as an opportunity to change lives and inspire people. We all have our own challenges, mine just happen to be slightly more complicated. You’ll hear very few complaints with my existing care at my hospital. I thank God once again & again & again. Photo below of box containing my new ‘chap’ style gorgeous full-Leg stockings!! Paris fashion parade, here I come!! ﻿Jodies Journey - Blog 62. ﻿For the past 3 + months, this R swollen ankle has been a total mystery. No break on X-Rays and no fall that I can remember. However, after a nuclear bone scan, 2 sore locations on either side of the foot, correctly revealed a lit-up patten of ‘Osteoblasts’ or ‘New bone growth’ in those sore locations. The pain (even with pain relief) was strongly felt, although without extra meds, I wouldn’t have been able to move. The nuclear science doctors, who recently performed a bone scan on the foot, agree that it is possible stress fractures and/or arthritis, caused by what happened to me 10+ years ago. The R leg is weak, due to extensive tumours that were located (delayed) in and around the S1 back nerve root and the Sacrum bone. As a result of the delay and weakness, I now have atrophy of the leg, drop foot, nerve pain (controlled by drugs) and a very susceptible foot to breaks and falls, etc. There is not much I can do - but try to rest and let it heal, which is why ‘Osteoblasts’ were detected. On another front, due to my increased nerve pain in the S1 - I convinced my Neurologist to consider an MRI for the purpose of ruling out new tumours. She quipped that MRI’s has never been very good at isolating evidence that I had active disease munching away @ my nerves or bones. However, I told her that I should have one - just in case. She eventually agreed. So, we found nothing but regular scar tissue - of which tightening of the scarring had to be accepted as the cause of my increased nerve pain. However, we found accidentally (another rare) and nasty long term complication of my GVHD (Graft Vs. host Disease) rescue, post transplant (3 years ago)!! The MRI revealed a vacant cavity in the top of my R hip bone/ball - top of the femur. Not yet causing me pain - I was then told that in the near future to halt the disease (called Avascular Necrosis or AVN) I’d probably need a hip replacement!! Yep, you heard right!! A hip replacement. Little by little my bits are being replaced with other peoples or from a plastic/metal form. I was totally stunned to hear this. AVN is caused by many issues and is basically ‘bone death’ - however, my Heamotologist was able to pinpoint my cause, as 3 years ago, after transplant to be rescued from GVHD, I had to have a drug derived from the glands of a horse, called ‘ATGAM’, coupled with 5 day’s of massive steroid infusions if 1,000mg per day. To put that in perspective: I currently only take 10mg per day. 1,000mg is massive and now 3-4 years down the track, is causing this new disease. But, like before - I have to be strong and busy and happy - as being anything other that that is a lie of a life and not something that my path wants me to follow. WWJD? Simply put: Jesus never lamented for the state of his body - but, put it all in God’s hands. Regardless of his pain. My pain is also in God’s hands. This is all a bit of a surprise - however, nothing much worries me any more. There is nothing I can do to change any of this, except to pray and trust in God. I have the best doctors and mostly, they deliver for me - what I need in a timely manner. Remember; if you are facing your own issues and need an advocate to support you and communicate for you - I am available. Just go to my contact page and see the information there to make a booking. I can advocate for anyone, worldwide. The below photo was in regards to my recent blood collection to make my Autologous Eye Drop Serum. The Serum is similar to 'tears' and helps my eyes cope with the GVHD disease, after transplant. Jodies Journey - Blog 61. So, read up - tell your friends and enjoy. What is going on with my health? At the end of last year; I noticed a change in my mouth sensitivity and also my ability to stay 'in breath' when eating and talking. These two things related to GVHD have been most annonying and with my specialist's help, we have changed and added some medication for trial purposes. My chemist knows me well. I get most of my medications there and they assist me with all sorts of help and advice along the way. When I recently asked my chemist, if she knew of any other people who took as many med's as me daily, she said the closest was 24. I am now taking 50!! The main 'medication' for me is bedrest. I utilise this as a treatment for my fatigue and pain, during the day. I have been busy, busy writing lately and talking to my new friend, Julie Randall (Patient 71) and also working on a property project with proptery specialist, Orane Swan. Both ladies have alot of experience and I love learning from people who are 'movers and shakers'. Thants all for now - hope you are all well. I love reading your letters, so keep them coming. If you or a loved one require 'Consumer Consultation' please go to my CONTACT page and read about my services. I may be able to make a difference for you, in your time of need. Jodies Journey - Blog 60. Being a health blogger means I get to talk to many patients, medical staff, health committee’s and media. Just lately, as a family we've decided to try becoming 'foster carers' for a city dog & cat rescue group. We have now had the experience of caring for 2 rescue dogs. Our first one was 'Oscar' - a 13 year old Bischon Frise and then 'Bailey' - a 5 year old Maltese-Terrier. Both dogs came from a background where they were either dumped or neglected and both little boys were adorable in their own ways. As much as we gave to them in love & food: they gave back to us in licks and cuddles. Both dogs worked well with our own Maltese-Shih Tzu (Bobby) and both dogs have now been successfully rehomed. The dog 'foster caring' experience (provided by a Brisbane group called 'Little Legs Dog & Cat Rescue) has been a wonderful learning experience for our teen girls, who have learnt how important it is to volunteer for community and assist 'people & paws' when the going gets tough. I highly recommend considering dog and/or cat foster caring as a way to 'give back' from home and also assist a needy community organisation. Because, of my many health issues, due to triple cancer | medical negligence | transplant | GVHD - I often find it hard to actively volunteer (or work at all) outside of my home. This is why 'foster caring' for these fur-babies makes it easier for me to stay involved and assist where needed for a cause that is greatly connected to my heart. At-home volunteering; is a great opportunity for anyone who has health issues and/or finds it difficult to be mobile or active. Therefore, our experiences as foster carers now lead me to the subject of this blog. I truly believe that the role of animals and pets in our lives are very important. There is a reason why God blessed us with them, particularly 'smart' creatures we can communicate with like dolphins, whales, pigs and of course the canine and the feline. Many animals are not just here to feed us or to be part of the 'circle of life' - many animals contribute to stabilising our mental health, lowering our blood pressure and giving us a reason to go for a daily walk. However, I believe there are alot more hidden benefits to animal companionship, that we as humans are still not aligned to or aware of. Science plays a role here in finding out the key health benefits those animals or pets are able to provide for us, as human beings. An excellent dog owning website, has created this article with the health benefits of pets featuring readable studies. I know for a fact that the animals that have passed through our home, either temporarily or permanently, have helped me with my health and that of my family. All science aside, having an animal in our home, always provides a cuddly, cute and sweet member who also gives us something to laugh at and something to giggle about. Our girls and we adults have always enjoyed having a small dog or two around and not only playing with them, but watching them play with each other!! We all know how incredibly healthy laughing and being happy can be, for our personal health and family health. My next point, in relation to the above thoughts is about caring for the animals that take care of us. There seems to be enough evidence to suggest that animals do a great deal for us and our health. Unfortunately there also seems to be an enormous amount of owners who don’t attend to the medical needs of their pets. I believe this is mostly because of the cost of veterinary services. Good vet work can cost a fortune; specialist vet work - even more, with some surgery’s now specialising in chemotherapy and radiation therapy for animals. Only ten years ago cancer services for animals was unthought-of. Animal Rescue’s, pounds and shelters are full of animals who have been surrendered because the owner cannot afford veterinary care and have let the animal go. The owners give up the animal due to their medical issues and the costs associated. I believe this is such a sad thing to do to a bonded animal and also to a family that loves their furry companion. There is one important consideration and ‘item of action’ to take care of, when one buys, adopts or rescue’s an animal: pet insurance. All insurance is important and this I realised when I was found to be suffering from blood cancer number two and was required to leave work permanently – insurance saved the day, for me and my family. We have always insured our animals and there have been occasions when it has payed off. Insurance money to some people is dead money, however for us – we don’t consider it so. We consider it a vital part of life and an important component of having a furry companion – being sure that from month to month, we can be guaranteed that if our little guy needs urgent surgery, treatment for a lump, investigations for odd symptoms or maybe a nasty injury. Jodies Journey - Blog 59. Jodies Journey - Blog 58. This blog is very specific and may help some of you, in your health journey's, with whatever you are facing. Many people who contact me are dealing with all sorts of issues, including blood diseases, cancers, pain, back issues and mental illness. There are those who also contact me with symptoms fearing they may have some of these things and are on a search for the answers. For us as a family, we deal with a variety of illness and disabilities daily - supportive therapy, supportive education and supportive medications are key for us, as well as a calm and positive household. Living in a calm, positive and uplifting household is most important to being able to manage what we deal with daily and how we make it through the toughest of times. Our faith is also key to maintaining a healthy place of rest and calmness. We feel that have core values & common beliefs help us to remember that (for us) life on earth is temporary and so are our challanges. We also feel that one important part of our calm and healing home is owning/being master of a fur-baby, either a dog or cat or another pet. We have alsways felt that we were meant to rescue animals that have been left unwanted @ shelters. We have had 3 shelter dogs in the past and curently look after our main small dog (a Maltese-Shih Tzu) named 'Bobby'. We adopted 'Bobby' some 8 years ago, when he was just 2 years old. His first family dropped him off @ the local city RSPCA and said they couldn't keep him, as they had to go 'travelling'. We will never know exactly what or where they had to go, but we were told there were some tears shed when he was dropped off. We can understand that, as he is very loving, caring and receptive. let me know what you think - I'd love to hear from you!! Jodies Journey - Blog 57. You've all been on my mind alot lately, as I know some of you read through my blog carefully to garner strength and coping stratergies when life is tough for yourselves, in whatever you are facing and being challenged with. Usually, I don't blog, unless I have a major health set back, but to keep my blog up-to-date, I usually make sure I enter something at least once per year to let you all know that I am alive and well. As some of you may know, due to my rejection disease (skin, mouth, throat, lungs & eyes) - I must take alot of pills daily to keep my body from rejecting my new marrow. This is a similar process to a person with an organ transplant, who must have anti-rejection medication for life to keep they're body from rejecting the new organ, it's the same with bone marrow. Even if I have the closest match available to me on the worldwide registry, I am essentially taking in a part of someone's body, that is foreign to me. Even though, you can't see my transplant on the outside of my body - I am often reminded that my body struggles, when I try to walk fast, carry anything of weight or have to work harder than normal, that I carry the DNA of another person from another part of our world. Due to all the drugs I must take to keep my marrow and rejection disease stable, my immune system (over the course of a month) becomes weaker and more susceptible to infection. This is why I have to go to the hospital monthly to recieve IVIG infusions of human Plasma every month. My Heamotologist also checks to see how my body is generally. For example, recently I had a bout of gastro and could not get my stomach cramps under control. I ended up going to the ER via ambulance and staying in Heamotology for about 5 days, until I was stable and ready to commence all of my regualr drugs again. Then, in another fun episode recently, I contracted an upper respitory infection, from a common cold that my daughter brought home from high school. I didn't end up in hospital, but the infection took hold quickly and I required very strong extra antibiotics and several GP visits. So, in many ways, although I am now not subject to blood cancer (currently) - I am permanetly sick from rejection disease and susceptible to quick and easy infections and illnesses. Acquiring something like Pneumonia on top of GVHD of the lungs would be a disaster for me and would mean instant hospitalisation. However, I would rather be sick and managed, than dead and not able to raise my kids or family. My kids and husband are doing good and the girls are growing so, so fast - Anna has lost almost 10kgs and we are now really focusing on getting Julia's weight down to a healthier level. Both girls have struggled with this area of health over time and we have all as a family reduced the amount of food that we are consuming. I want to encourage you, whatever you are dealing with in life. Take a page out of my book, keep busy and use your journey to inspire and help others around you. I feel it's a joy and a priviledge to take to cancer patients regularly, via social media and on my monthly hospital visits. What an amazing ministry to have. I thank God everyday. Jodies Journey - Blog 56. Just a very brief blog to let you know that I am OK and still recovering from my Allogenic BMT, performed in December/14. My mouth, skin and throat are all OK. My lungs still rattle with a condition called BOOP, however are much better since contracting the condition (GVHD of the lungs) in August/15. My biggest struggle at the moment is my Ocular GVHD, which is slowly getting better, but since March/2016, has been a total bummer and one that annoys me daily. 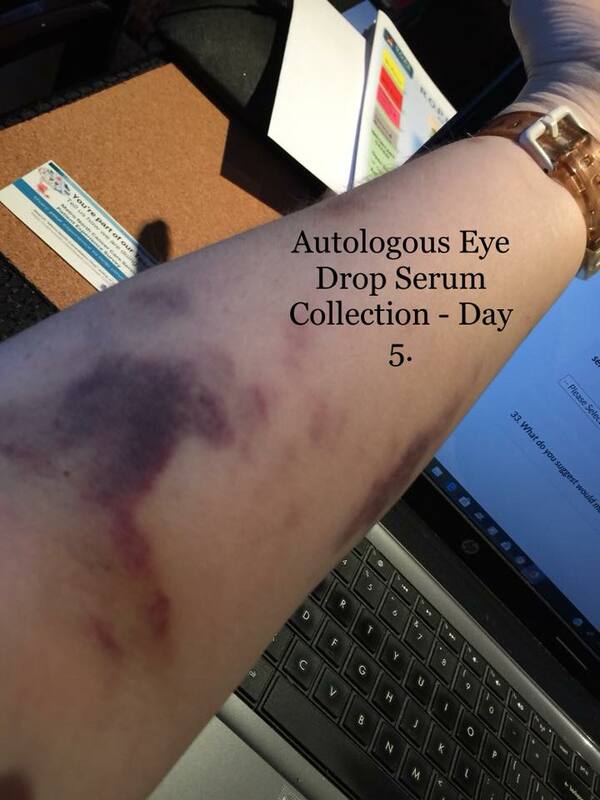 I am speaking to Opthomology about this condition and hoping for an Autologous Serum to heal my eyes completely, or as best as possible. The one area I must balance is my fatigue, which visits me on a regular basis. I currently take 47 tablets per day. However, I am alive. Lately, I have been writing my autobiography, re-taking up my competition hobby and trying to win a car or maybe a good dash of cash. It's lots of fun and I seem to be particularly good at the '25 words or less' entries. I have won about $16,000 worth of prizes over the years since 1997. But, probably could have won more, if I had continued during illness periods. I am looking at possibly doing a small amount of work on a weekly basis, as I progress to better pastures and become healthier every day. In January, this year, we recieved our Hydrotherapy spa and the family have been using it and enjoying it. Thank you to Couee Community and Aqua Pulse Spas. Jodies Journey - Blog 55. A huge thank you to my husband & kids for caring for me during transplant & post transplant. A huge thank you to my parents (Robert & Linda) for caring for me post transplant, for 3 months - in their home. A huge thank you to my sister (Sally) for her constant support & care. A huge thank you to Elizabeth Parish & for her meal/cleaning crew, whilst I was in hospital. A huge thank you to the meal/pastoral & leadership crew @ Bridgeman Baptist Community Church. A huge thank you to the Living Faith Lutheran Church & Primary School for prayers & support. AND to everyone else who has prayed for me (and continues to pray) and sent their best wishes, a HUGE thank you to you also. Thank you for continuing to follow along on what I would summise as the most challenging portion of my journey. Pre BMT (19th December/15) and post BMT (Bone Marrow Transplant) - much pain in my bones, fevers and general unwellness was had by myself. Searching the world for an unrelated bone marrow match caught me by surprise, in how emotional I would feel towards the medical scientists working hard to save my life, the scientist who would eventually fly across several world time zones to receive a small bag of stem cell enriched blood and ultimately my donor, a 30 year old young man from overseas. It was his sacrifice, of 5 days worth of stomach injections, then 2 days lying flat -1 needle in each arm-﻿ on an Apheresis machine that has continued to amaze me. For a young man, who would receive no payment, nor even know who I was - to sacrifice all this for me - blows my mind. I still cannot fathom his gift to me. I am in the process of writing a thank you letter to him and his family for donating his time, effort and bone marrow to save my life. I cannot know his identity for a full year after my BMT. I would assume that this is to protect the process and encourage him/others around him - not to feel bad or responsible for any side effects, I might suffer from as a result of the BMT with his cells. What also amazes me is that fact that I now own his DNA, in my blood and bone marrow. I also have his blood type now. If you took Blood/Bone Marrow DNA from us both, they would be identical. Incredible. After my BMT I also starting craving strawberry flavoured things. Not my favourite flavour before transplant, but it is now. I will have to ask him if he likes Strawberry, as it is claimed that the receipient of the unrelated bone marrow may take on some of the traits of the donor, after BMT. So, surviving a BMT is something few people can claim to have endured or benefited from - for which I am eternally grateful. Then, after a 2nd day - whilst I was waiting and having 7 days of chemo, in my country and with my donor's bone marrow in an ice box. A scientist courier got on a plane and flew around the world for me (and with my life in his hands) - on the 19th December/14 - finally, my rescue arrived at my hospital in Brisbane. What a miracle! What an incredible process! The actual transplant created a huge migraine due to the fact that my donor's blood type was different to mine and I required a certain kind of drug to stop a reaction of bad preportions. When his cells were injected into me, I had no live bone marrow, no capacity to produce my own diseased blood and the need to have 2 blood transfusions per day, whilst my marrow was being killed off by some of the strongest chemo available. Above is a photo of my long hair, cut before it fell out to donate to the Pantene 'Beautiful Lengths' Programme. You've gotta have some sense of humour on this journey. Some cancer patients hate the word 'journey' to describe what they are enduring, however I welcome it - as a portion of challenge) now 11 years in duration. I know this portion is temporary - this body is just a physical body and my eternity is simply the most important part of my exsistence. So, yes - I have my bad days - when I feel literally depressed and anxious about what my body has endured and is enduring currently. The drugs I take, (currently 44 per day) make me sleepy, drowsy and feel 'out of it' at times - so, I have to remind myself, this place, this journey is not my home. This journey is temporary, on this earth - this physical life for me in my body is also temporary. Eternity with my saviour, surrounded with my treasured and loved family and friends is what I finally aim for AND I will get there, in God's timing. Above is a photo of my donor's Stem Cell enriched blood - transported from overseas and ready to be transfused into me. So, when problems strike us - and they will, if we live on earth, placed here for a certain purpose - we must be brave, even in tears, even in whimpers, even in anxiousness. These are normal human reactions to difficult times, that often we have no control over or no predictible timeline to sooth ourselves in. It's the 'not knowing' what, why and how this is all occuring to our bodies that can be the most distressing - therefore; I encourage anyone reading this, to read and educate yourself (as much as emotionally possible) about the disease you are dealing with. Do so, only in a good frame of mind and when you can tolerate the information - some of it is dry and not written to soothe a patient, but more for fellow medical scientists. However, the more you know - the less distressed you may feel. At least for me, it works this way - but it's the choice of timing and when it is best to 'take it in' that is crucial for your emotional and mental health. Let me also say, there is no shame in admitting that you may suffer from a post traumatic mental illness, as a result of your diagnosis - it simply happens to the human mind, regardless of how strong or faithful you may feel or be. We are all human and none of us should feel shameful or poorly for needing help or requiring medication. Below is a portion of my treatment timeline. My full treatment list is located on this page. for History Makers TV - a great project with some awesome world shakers, making a difference. The video itself will be sent to several inspirational TV networks around the world. My interview is located @ 44.36 minutes for those that need to skip ahead. Fourteen weeks in hospital (over 3 admissions) for my transplant related issues, make me appreciate home. ﻿﻿Jodies Journey - Blog 54. GREAT TRANSPLANT NEWS: After lots of emails and phone calls between hospitals and donation registries - we've got a 'green light' from my overseas bone marrow donor. We start chemo this Friday, 12th December. My donor's bone marrow/stem cells will be 'harvested' in his country between 15-16th December, whilst this is happening a Brisbane scientist will be dispatched on international flights on the same days. He/she will go to the donor's hospital to pick up the cells and jump back on a plane to have them back at my hospital in Brisbane by 18th/19th December. The stem cells will be infused into my blood stream, via transfusion on Friday, 19th December. This will be my 2nd birthday, when I have been given a 2nd chance at life - by a man who is giving me the most precious gift I could ever ask for. I want to hug this man and the scientist flying to another part of the world to save my life, but I can't find out anything about them until about 1 year after the transplant. I will be writing some anonymous thank you letters until then - so happy to get this finally underway. ﻿Jodies Journey - Blog 53. Just a general update after a crazy past 7 days and a doctors visit on Tuesday (02 Dec/14), this week. My transplant doctor agreed with me that my escalating (out of control) bone pain was a crisis and we needed to manage it properly with strong morphine medications. Previously, I've been on low doses. I was given some higher doses and we had a plan to check my pain levels twice weekly + the virus. Plan B was if these stronger oral meds didn't work: we start knocking on the door of the palliative pain care team. Even though, we are not planning on me dying - they are the best at what they do and can manage the most extreme malignancy pain - even if I have to get a pain pump inserted under my skin. After trying these new meds on Tuesday night, having an escalating fever (38.2C) and not getting any response at all, except with Nurofen/being on 6 medications, I told my doctor (via phone) on Wednesday morning of my previous bad night + a new sore throat. Doctor arranged on 3rd December for me to go into hospital for at least a few nights to sort out my pain, virus, fever, etc. Apparently, the MDS (Myelodysplasia) can cause fevers on it's own. After another night in pain, we tried an inter muscular injection to stop my bone marrow inflaming cramping and spasmsing my muscles around them: http://en.m.wikipedia.org/wiki/Ketorolac - no Valium needed, 30ml of this is enough (so far/so good - it's been over 24 hours). ﻿﻿Jodies Journey - Blog 52. ﻿﻿Jodies Journey - Blog 51. ﻿﻿Jodies Journey - Blog 50. ﻿ ﻿﻿﻿Jodies Journey - Blog 49. Pre-Transplant Work-Up/Testing will start in the 3rd week of November. Medical dates sometimes change depending on hospital requirements. 10/11/12th November - Jodie will have three days of testing, pre-transplant to make sure her body and organ's are healthy enough to progress to transplant. The comprehensive physical work-up also includes skin and dental check's. The cost of the transplant is approximately $200,000AUD, covered by Medicare. Jodie's donor has been chosen - a 30 year old male from overseas, he is a 10/10 tissue match. Even so, a great deal of care is taken in terms of monitoring, as the new cell's are not identical to Jodie's. Only a small amount of information to released about Jodie to the donor and also about the donor to Jodie, this is for privacy reasons - however, both Jodie and/or the donor may elect to make contact and/or meet each other around the recommended time of approx. one year after transplant. 29th November | HICKMANS CATHERTER SURGERY: hickmans catherer insertion surgery and admitted to the bone marrow transplant unit. 30th November to 6th December | TRANSPLANT REVERSE COUNTDOWN STARTS | IN-PATIENT CHEMOTHERAPY COMMENCES: seven doses (1 dose each day) 5 x Fludarabine and 2 x Melphalan. During this time, Jodie's international donor will be injecting G-CSF into his stomach twice daily to increase his stem cell production, via his bone marrow. These extra stem cell's will be released peripherally into his blood stream, where they will be collected via an Apheresis Machine and separated, from the rest of his blood which (of course) is returned to his body. The stem cell's are then preserved and prepared for the trip to Australia. The donor rests for 1-2 days after collection. 4th or 5th December | DONOR STEM CELLS COLLECTED: in the donor's overseas country. 5th and 6th December | DONOR STEM CELLS TRANSPORTED: from overseas to Australia. 07th December | TRANSPLANT DAY PLANNED: (no chemo on this day) the donor's stem cells would have already arrived at Jodie's hospital or may still be on their last leg of their journey. The cells will be contained in a large box of ice and look like a full bag of blood. From the day of transplant the reverse count is halted and a positive count up begins. The first 100 days post transplant are the most critical for Jodie, as her body copes with no immune system, plus get's used to another set of stem cell's/bone marrow making themselves at home in Jodie's body. 08th December | TRANSPLANT COUNT-UP STARTS: post transplant day +01 DAY ONE. 08th December 2014 to 19th January, 2015 | SIX WEEKS (Post Transplant) IN HOSPITAL/CLOSELY MONITORED: if Jodie is well enough to leave, she will be discharged from hospital around the 19th January, 2015. 19th January to 19th March, 2015 | TWO MONTHS OF FAMILY CARE: doctors have requested that Jodie be monitored closely and cared for by a family member, post transplant. A large amount of anti-rejection and anti-infection drugs are given to Jodie, post-transplant to take and she will need to be taken to hospital twice per week for doctors visits. 19th March, 2015 | COME BACK HOME: after Jodie has been cared for approx. two months by family, she will be ready to come back to her home with Greg and the girls, hopefully by the above date. For Many Years | WATCHING JODIE: Jodie's Heamotologists and transplant team will closely watch Jodie for the rest of her life. The goal is cure or at the very least long-term control of Jodie's two blood diseases. Cure is usually assumed after 10+ years post transplant. ﻿﻿Jodies Journey - Blog 48. Hi everyone!! No doubt you have all been wondering what is happening with the Jodster and her transplant. Well, here's the scoop. Yesterday, Greg and I again saw my transplant doctor to discuss a new transplant proposal. Due to the risks involved in my treatment/past treatment and my possible sensitivity to radiation - we've been offered a less aggressive Allogeneic Transplant. The highest range that the most aggressive transplant is performed goes to 50 years of age. When I was first diagnosed I was only 35. I am now 43 - however, we suspect that my right leg issues are due to delayed radiotherapy toxicity from emergency radiotherapy in 2006 (which is extremely rare for most levels of radiotherapy). Having medium/average strength of an allogeneic transplant means no radiotherapy and a change in chemotherapy treatment. 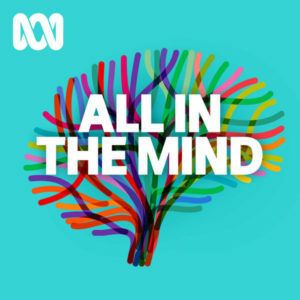 My now large transplant team sit around a boardroom table every Monday, and discuss my ever on-going & dramatic latest medical dilemma and figure out what to do with me. Often many intelligent brains make for better decisions. Once I have had 7 doses of chemotherapy as an in-patient, the donor stem cells from my international donor will be injected into me to engraft and gradually grow into my new bone marrow. However, the donor's T-Cells will not have been wiped out by the chemo that I had prior to injection and therefore will start fighting any left-over disease and restore my bone marrow to healthy status. This is the plan anyway. We were more than happy to accept this, coupled with more intense therapy and assistance to keep me both emotionally & mentally stable through the transplant, which will still be sufficiently strong enough to cure me. Even though it will be a softer transplant, I may still have a rough road ahead. When my doctor told us of the new offer on the table, I felt 100% more at ease about the new treatment plan. Of course, any transplant is going to be rough to deal with and endure rejection of the new cells, but all in all, I think both my transplant team (10+ doctors & staff) are convinced that this is a better way forward with less risks associated. In fact, my doctor suggested that according to the progressing table of research, it seems more & more likely that in 10 years’ time, FBI (Full body irradiation) will no longer be used as standard. Accordingly, it does not seem to offer much more protection, as opposed to the proposed milder transplant. At this stage, it looks like we will start 'work-up' testing x 3 days in mid-November and have the transplant by the end of November. However, my doctors have indicated that they need to get me into hospital before the G20 summit, being held in Brisbane City in mid-November and have the cells arrive in Brisbane before the world's 20 most powerful leaders arrive in Brisbane. More drama!! There has to be absolutely no hold-up's with my new cell's making it to me from my donor/his country to me (in hospital) within 72 hours of being harvested from him. So, at this stage, it looks like we'll be having a G20 transplant and a Christmas/New Year recovery. However, as with all treatment, things change rapidly in this business and medical arrangements are rarely ever firm - but, often fluid and forever changing. We have also been offered the opportunity to participate in a randomized trial conducted by a group of research scientists looking at the role of an experimental medication to eliminate/minimize the effects and damage caused by GVHD (Graft vs. Host Disease) post-transplant. GVHD is a disease that almost certainly comes after engraftment of my new stem cells into my body and into new bone marrow, saving my life (of course) but, ultimately introducing another person’s body part into me, which can cause rejection of the stem cells. This is even with a 10/10 match. Doctors look for this disease to find indication of the stem cell’s working in the host body – a little GVHD is OK and can materialise in several forms. In some cases, GVHD can be life threatening and this is why I am closely watched and monitored post-transplant. In the trial, I will either get an active experimental drug or a placebo. My doctors will not know which one I am getting – only the researchers. I am hoping I will get the magic drug, however – this is why randomized trials are so important for the future of medical research and why my participation may help save the lives of some of our kids and grandkids. We get quite a lot of detail from our doctors and as you can imagine – it’s not so nice to continue going over the not so nice bits, which are all on the internet anyway. We are aware that this is a difficult process to read about. So, we try to communicate in a positive manor. Through this whole amazing process – I am forever grateful to God, my donor, my doctors/hospital, my church, my prayer warriors, my friends and most importantly: my family. On a lighter note, most of my doctors are female and I had originally wanted a female transplant doctor, however we stipulated that as long as my young male transplant doctor wore a pink tutu and a couple of roses in his hair AND I can have access to lots of females that I can cry with - we'd be OK with that arrangement. I have also asked him to prepare himself with lots of daggy dad jokes and we will be just fine. Jodies Journey - Blog 47.
and mental health hospital based support prior to transplant. We had firmly asked for this in July - however, it had not been followed through. We are pleased about this, as we want to be absolutely 'prepared' in every sense of the word. Currently, we are looking @ a November start for transplant, at this point. Once transplant starts, I should be spending 6+ weeks in hospital: Manage side-effects, pain and various other medical issues as the cells engraft. I will be in hospital for approx 6-8 weeks and in home/family care for up to 3 months after transplant. I will be coming back to hospital twice per week for many months and taking lots of anti-rejection medications. I may be admitted to hospital on/off for up to 2 years following transplant to manage various engrafting or GVHD issues. My donor is a 10/10 match for me. I have not had confirmation as to which person is being used, at this time. The 'informed consent' meetings with my doctors have very, very difficult of late - as you can imagine. However, I think my team are finally starting to understand what my mind and emotions have been through and how to better manage my mental and emotional health through the transplant. It's going to a very difficult process, but we are trusting God for a perfect outcome and a cure. Recently, we spent 3 hours with a social worker. She is now taking control and trying to assist us with all our needs. Hopefully, things will change in terms of communication between all of my doctors and in regards to all of my specific needs + what kind of care we need to arrange for after transplant. My latest medical news is that I have now completed round one of an injection chemotherapy x seven days (Vidaza), by day five - (and as previously mentioned) my bone pain (in my thighs and hips) had stopped. To keep you all updated in a less confusing way, I have now changed my blog pages in a dated format with my latest news clearly at the top of my blog pages. This is where all my very latest information and medical journey will be located and blogged as I can. We were going to start my new round of injection chemotherapy Tuesday, 16th September and we were hoping for much less accute side effects. However, we hit a little bump in the road on Tuesday and worse on Wednesday, 17th September. I came in for my regular injection chemotherapy on Tuesday, but told my doctor that I was having a racing heart - I needed blood as my heart was strugging to pump oxygen around my body and needed more red blood cells to do that. My blood counts revealed that my red blood counts were only 78 - after 2 bags, they eventually went up to 138!! Amazing what a couple of healthy blood donors can do, no more racing heart or fatigue. After the blood transfusions, I went home with some anti-biotics as I had told the doctor about a sore throat (it felt like Pharyngitis﻿) - it was basically a nasty virus having a party in my mouth and throat. I came back the next day with Neutrophils (infection/virus fighting white blood cells) of only 0.02 and a raging temp of up to 39.2c. Doctors started me on antibiotics immediately and transferred me to the ward. My whole mouth and throat had swollen to point where I could hardly talk and could not eat or swallow much. The doctors started injecting me with a special white cell growth factor called GCSF (Granulocyte-colony stimulating factor), which stimulates my stem cells to produce more white blood cells into my blood stream and fight off the virus attacking my body. This move worked. The following day, my Neutrophils rose to 0.3 and again the next day, they were 0.4. My four hospital nights were filled with fevers and alot of mouth pain that was been difficult to control - however, as the days progressed, my mouth and throat pain greatly improved, due to the GCSF, climbing white blood cells and lots of prayer :) I am still on pain relief and my Neutrophils should have reached 0.5 for me to be able to safely leave hospital, but with supporting medicine (GCSF) - I was released @ a count of 2.7. I also got another bag of blood before I left, as my red blood cell counts had taken a nose dive again. Had I known that my white cells were so low, I would have left home immediately, as both my girls have had a cold virus. 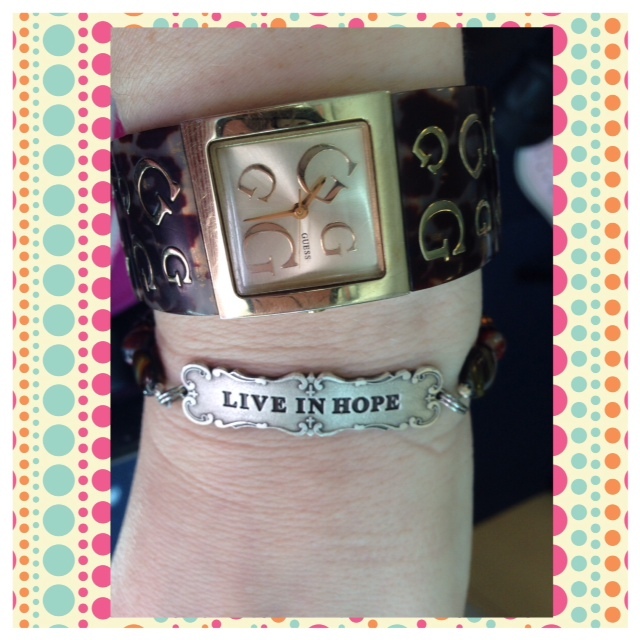 My delayed next course of chemotherapy is scheduled soon (late September). We also now have the first dash of donor news, providing a possible positive rescue for me - my Bone Marrow Transplant Team have now located two possible donors, according to compatible tissue typing. This is great news!! These two donors are still in the testing phase. Depending on this testing, the donor pool may change. Currently, one is a 30 year old male and the other is a 21 year old male, both located overseas. Due to strict privacy laws, we cannot know any further details, including the country or residency. This may change after transplant. Transplant has been booked for October.﻿ Once the donor has been chosen, transplant conditioning of my bone marrow will begin, after seven days of large quantities of chemotherapy & possible full body radiation, a nurse or specialist courier will personally and urgently transport the cells, via overseas flights & transport, in co-ordination with my transplant progress. The cells must reach my hospital within 72 hours, otherwise they may not be useable. Conditioning will continue whilst the cells are in transit. A reverse countdown begins from 10 day of conditioning, until the cells have arrived at my hospital. Once transplant occurs (and possibly before), I may not be able to speak/eat without assistance, etc due to mucositis and/or various complications and/or GVHD (Graft Versus Host Disease). Accute recovery can take 4-8 weeks in hospital and long-term recovery can take up to 2 years. Our family would also love your assistance to complete our very needed Hydrotherapy project for a variety of medical reasons, so far, almost $3,000AUD has been raised. Companies or organisations are particularly encouraged to consider assisting in completing this project, via various means: donations, fundraising dinners or events, etc. Please go to the following link to see all the current details: http://www.jodiesjourney.com/jodies_triumph/hydrotherapy_thanks for more information, about what we need AND would like to offer to other families to use, with special needs. For prayer & specific practical assistance for the Guerrero Family, please contact Mrs. Liz Parish & Ms.Jessica Parish (limaje62@gmail.com) - prayer and practical assistance is being provided from the Living Faith Lutheran Primary School/OSHC and Living Faith Church (Murrumba Downs). Liz & Jessica have (very kindly) set up the practical assistance form for Jodie and her family, as listed above. Additionally, The Guerrero family also have prayer and visitation from their Baptist church @ Bridgeman Downs - Bridgeman Downs Baptist Church. For more information on continued prayer via Bridgey Baptist, please contact Mrs. Jennifer Campbell at the church (office@bridgeman.org.au)﻿. EVERY PRAYER, EVERY MEAL, EVERY WELL WISH, EVERY DROP OF LOVE IS ALL VERY MUCH APPRECIATED. Survival of any infection and no long-term side effects of the transplant chemo/protocol and/or rejection of the donor's stem cells. No distress for Jodie's family, as they see this important process take place.